They say it’s your birthday ……..
And even though we had gone to bed so late, we were up at the crack of dawn. We peeked out onto the balcony to see if we had been dreaming the room upgrade, but the awesome view was still there. The sun was just coming up and Tom put on some coffee, we grabbed some doughnuts and sat out on the balcony watching the sun and enjoying the view. After our first cup of coffee Tom started getting ready, while I did a little repacking to have empty carry ons to be filled with drinks to take on board the Magic. At around 7am we shared the second half of Tom’s birthday cake for breakfast, then put everything together in a corner, hung the “Do not disturb” sign outside the door and headed down to the lobby. I made sure we could leave our luggage until 11am and they even offered to extend our check out time but there was no need to do so as we needed to get to the port anyway. But first we had a breakfast ADR to go to. We walked over to the Magic Kingdom, went through bag check and were inside the park in less than 15 minutes after leaving our room. It felt so good to finally be back to the park after 13 months and we loved walking down Main Street and enjoying the view of the castle and the tram coming down the street. And how cute was it to see that they had fixed an old children’s toy at the tram. That’s one of the things you will only find at Disney. Soon we walked through the castle and Fantasyland and walked up to the Beast’s castle. A few days before we had left for the US I had found out that Be Our Guest was now serving breakfast. With that in mind I had tried for a reservation and got one the first time I tried and at the perfect time. And here we were now, checking in. We were quickly pointed towards the castle where we followed the red carpet and soon had placed an order and paid for it and were now looking for a table. The ballroom was buzzing with people so we went all the way down and then turned right into the gallery. We picked a table at the side, Tom went to get some drinks for us and I started taking photos of the room. It didn’t take long and a Cast Member pushed a cart our way and delivered our breakfast. 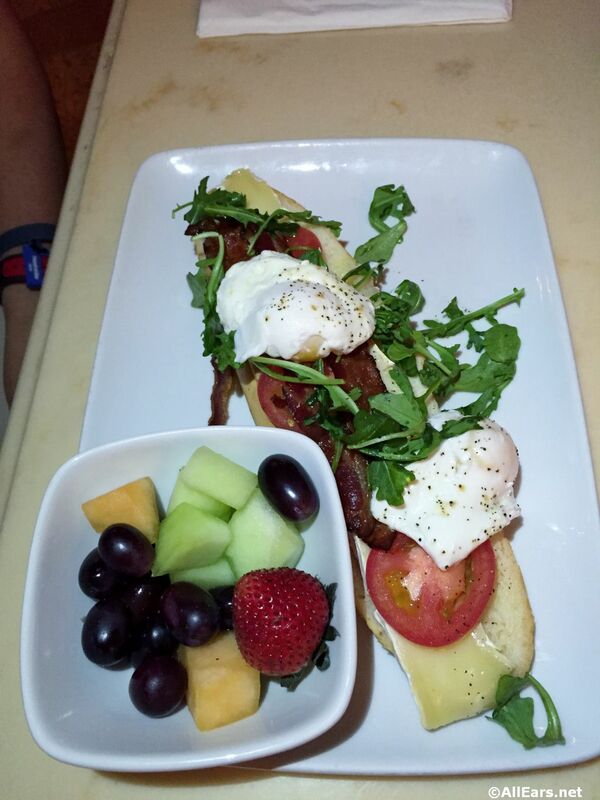 We had ordered two dishes to share, the Open-Faced Bacon and Egg Sandwich, Poached eggs, Applewood smoked bacon, Brie cheese and Arugula on a toasted Baguette served with Fresh Fruit and the Eggs Florentine, a Puff Pastry Shell with Scrambled Eggs, Cheese, and fresh Spinach served with Country Ham and Roasted Plum Tomatoes. We were also served a plate of Breakfast Pastries. And after taking pictures of the food we cut everything in half and tried our breakfast. The open-faced sandwich was nice, but the baguette was a bit on the hard side. We both loved the Eggs Florentine and the pastries were nice but not really anything special. All in all the breakfast was pretty good and we enjoyed it a lot. Birthday breakfast over, we walked to the exit, took a few more photos of the interior of the castle and then walked right over to the Seven Dwarfs Mine Train to use the first of our FP+. There was already a stand by wait of 70 minutes and we thought we were in for a wait even with our fast pass, but after scanning our magic bands we walked through the line and within 2 minutes we were seated on our mine train. This was the first time we ever rode it and we both tried to get a few photos while enjoying the ride. It wasn’t all that easy but we succeeded in the end and were quite pleased with the photos when we checked them lateron. The ride had been good fun and we knew that we wanted to ride it again, but it will still have to wait until we return to WDW in 2016. Once we were off the ride we walked around a little, explored some shops and walked over to Cinderella’s wishing well, donating a few coins and wishes. Then it was time to check out the new areas in front of the castle, which we had read about but had not seen yet. We still had to FP+ but a look at our watches told us that it was better to let them go and head towards the exit if we wanted to be out of our room in time. So we started to slowly move down Main Street, just to see the dancers perform right where the side streets enter. Needless to say we had to stop and watch and enjoy their dancing. Then it was finally time to leave the park. It had been a brief visit, but the perfect start to Tom’s actual 50th birthday. Once we had exited we headed towards the resort monorail, so we could fit in another “ride”. The monorail just pulled into the station when we reached the top of the walkway and since about everyone left to visit the Magic Kingdom we got to have the car all to ourselves. We got off at the Contemporary, used the ATM and walked through the shops admiring the Easter basket displays they had before making our way over to Bay Lake Tower. I had asked if we could stay in the room until 11am and they had said that it was no problem and we had even been offered a later check out time, but we needed to get going anyway, just wanted to spend a little more time on the balcony enjoying our upgrade. So after another Coke while enjoying the view we collected the rest of our things, checked for forgotten items and moved the rest of our stuff back to the car. In no time it seemed we went through the Contemporary’s exit and towards our next destination, Port Canaveral. But wait, we needed to do a little shopping beforehand, so we drove towards Downtown Disney, saw all the work going on and went towards the Publix that is close to Lake Bryant. And hit the traffic jam. We waited in front of a traffic light for more than 10 minutes, then decided to no longer waste time as we had made no progress at all and head to the Publix at Port Canaveral instead. We got out of the line and tried to find a spot where we could turn around just to see that there had formed a huge traffic jam in the other direction as well. So we just drove straight on, hoping that we would find a solution. Thankfully the GPS sent us up another street and soon we found ourselves on the highway, again, in heavy slow moving traffic, but at least it was moving. And as soon as we had cleared the airport traffic got lighter and lighter and we finally made good progress. It was already going toward noon, when we finally reached Port Canaveral and I aimed for the usual Disney sign at the harbour, but every time I tried it would change over to Carneval, which was kind of disappointing. We drove towards the town and soon found ourselves in the Publix parking lot. It didn’t take long to pick up a few drinks for the cruise, which we then put into the empty carry on before starting our way back to the harbour and the Disney parking structure. We arrived about 10 minutes later, paid for parking the rental car (and for those of you who wonder why we would pay for a rental car to just sit in the parking structure AND pay for parking – it saved us a lot of time on our last day! ! And since we were so short on time to spend at WDW this time it was more than worth it) and drove nearly all the way up to the top to find a spot. By now it was now past 1pm and we hurried to remove everything from the boot, crossed the bridge over to the terminal and went through security in no time as we were the only people there, then we went right over to concierge to check in and had our Key to the World cards in hand in no time, plus we got a DCL birthday button for Tom to wear as well. They had already opened up boarding to everyone, so we just walked over to the Mickey ears entrance and walked onto the ship. A minute later we heard our name announced and were back on the Disney Magic. Again, it hit me how small the Atrium is compared to the new ships, but this time I had been prepared for it and it didn’t bother me that much. There were two things we still wanted to do, one of them being to check if we had been granted our request of a table for two. So we walked to the side entrance of Lumiere’s and had a CM waiting right there to take us to the right table and in no time we knew that our request had been granted. Yippie. A look at our watch told us that by now they must have opened the staterooms and before we went in search of some food we headed up to our room to drop off our carry ons. I had Tom walk in first, as there was another surprise waiting for him, a DCL Birthday Package, which included a bed runner, a greeting card and a banner and a bottle of Fairytale Sparkling Wine to toast his special day. A short restroom break and we were off to find some food. For a moment Cabanas crossed our mind, but we wanted to try for Carioca’s as at least we would not have to search for a table. About 20 minutes before they closed the restaurant we walked up to the podium and asked if they still allowed guests in and were welcomed right away and were walked to a table in the back of the restaurant. And on the way there a familiar face caught my eye. And we must have caught his as well, as Jason, our server during the Med cruise, came hurrying over to us to hug us and say hello. The greeter who was taking us to our table had a pretty funny look on his face when we stopped right in the tracks to hug one of the cast members. Jason walked to our table with us, unfortunately it was not one of his, but he stayed with us and chatted for a minute or two and advised our server to take good care of us. And after getting over the initial surprise of running into Jason and ordering our drinks we were off to the buffet. We were more than surprised to find it well stocked, even if they only had one line open and we did not feel rushed at all. We filled our plates with some of the yummy food and then went back to our table to enjoy it all while they were still leading guests to the tables. While we were enjoying our first meal on board, Jason came over again and we chatted a little more and learned that he had just gotten back onto the Magic after his vacation and that Jay, his assistant server during the Med cruise was still on vacation and coming back in a few weeks’ time. Time was just flying by and we were politely asked to go up to the buffet again, before they had to close it, but we were both already pretty full and soon after that got up to check out our stateroom in more detail. Tom got to now closely inspect his birthday goodies and found that the card that had come with the birthday package was actually signed by Captain Mickey. We unloaded our carry ons and when we peaked out the door, one of our suitcases had arrived too and our stateroom host was just walking by and introduced himself. So with part of the luggage already at hand we started unpacking. But not for long, as it soon was time to head to the D-Lounge for the DVC welcome presentation. We grabbed an offered drink, found a table and watched and listened to the hosts excitedly talking about the new resorts. We were pretty pleased that there were no little “games” played in between and that it was kept fairly interesting. Point of the whole thing is selling more points and we are quite happy with what we have and don’t want to add on. At the end of the presentation we all got to keep the folders they had handed out and were handed a DVC hat and with that in hand we headed back up to our stateroom. We still had a little time before the Lifeboat Drill and wanted to unpack a bit more.I was putting things into the big wardrobe when we saw that the safe was broken and I really mean broken. Part of the outside panel was hanging down. And while we were still “admiring” it, the sliding door started moving and you could see that it just hit the panel when the safe was not closed. Off to find the stateroom host we went. He took a look at it and asked us to call guest services and they would send someone to fix it. But by now it was time to head to deck 4 for the Safety Drill. Thankfully this time we had not forgotten to bring sunglasses and were now waiting for the drill to be over. The CM in charge of our group was pretty funny and cracked a lot of jokes so the time went by really quickly. And without further ado we were dismissed and ready to slowly creep up to our stateroom with the masses. Once there we finally had enough time to call guest services and let them know about the broken safe. And we were impressed as within minutes someone knocked at the door, took a look, went to get a fresh panel and had it repaired. All in all it did not take more than 15 minutes and we were thoroughly impressed. And only when he left we noticed that the ship was actually already moving. So we quickly took our ship’s cards and headed to the top deck. We found a nice spot with not too many people around and started waving, especially when we got close to Fishlips as we knew there were several friends watching and they might just spot us if we waved just enough. And needless to say, a little later I got a message from my friend Teresa with a photo of us attached. We stayed on the top deck for quite a while until the ship had left the port and the captain had even used the Mickey whistle twice. Before we headed back to our stateroom to finally unpack we stopped at the quick service station and Tom picked up a Hot Dog and some fries and we added a bit of coleslaw for a quick snack in our stateroom. And after that it was finally time to unpack and unwind a bit. We were far happier with our stateroom this time, as there were no smells and even though you could definitely still see a lot of wear and tear it looked all in all better than the one we had had during the Med cruise. Once our second suitcase had arrived and we had everything unpacked and stowed away we sat out on the veranda with a beer and some Diet Coke and celebrated Tom’s birthday again. Time flies when you are having fun and it was soon time to get changed and ready for dinner. And at precisely quarter past 8 we walked down to Carioca’s for our first dinner on board. There is this thing about Europeans being on time, but we have learned that when we leave at exactly the time we should be there we can walk right in with very little to no wait. Works like a charm. So we arrived at the restaurant a few minutes after it opened and there were only two families ahead of us and within a few seconds we were led to our table for two. Our serving team came right over and introduced themselves, went through the allergy spiel and soon brought out our Diet Cokes, followed by the bread service, Warm Banana Bread with a Mango-Mint Mojo. We are both no big fans of banana bread, but we tried a small piece and then went for the rolls. Tom quite enjoyed the Mango-Mint Mojo, while I stuck with butter after tasting it. There were recommendations for dinner and after ordering it didn’t take long for the starters to come out. Tom had chosen the Tiger Shrimp Ceviche and Palmitos Salad, with Cucumber, Cilantro and a Tomato Citrus dressing. It looked really good and he enjoyed it. I had opted for a salad as well, the Cuban Salad, with Watercress, Avocado, Pineapple, Toasted Cuban Bread and a Cider Vinegar Dressing. It was really nice and fresh and hit the spot. Soon it was time for main courses. Tom had ordered Prime Rib, that I don’t see on the online menu and it came with a baked potato and some veg. I had Roasted Chicken over polenta, which I don’t find on the menu either. But both were really nice and a perfect main course. For dessert Tom had the Coconut Tres Leches “Three Milk” Cake, Moist Coconut Cake soaked in three milks and I don’t recall what mine was and if it was even from the Carioca’s menu as it looks much more like the White Chocolate Fudge Cake, served with Raspberry Coulis and Whipped Cream, which is on the Animator’s Palate menu. After finishing dinner we said goodbye to our server team and headed back to our room where we were greeted by a towel swan and our stateroom host had even refilled the ice bucket with fresh ice. It was still Tom’s birthday, so we opened the sparkling wine I had ordered for him and sat out on the veranda enjoying the night air before going to bed.